Congratulations to Dr. Tim Morrissey for successfully defending his Ph.D. dissertation titled: Ionic System for Electromechanical Transducers - Energy Harvesting and Soft Robotics. Tim is the first Ph.D. to graduate from the Keplinger Research Group and will remain in close collaboration with the team as he heads up the commercialization efforts for HASEL artificial muscles as CEO for the spin-out Artimus Robotics. It was a big February for Tim as he also welcomed his first son, Patrick, just a few weeks before his defense. Congratulations to the Keplinger Research Group on a new publication in a new field: The introduction of a variable capacitor energy generation technique which utilizes an electric double layer. This generator uses readily available materials to make a low complexity generator with possible future applications in marine energy or waste heat energy capture. The work is publishes in the journal, Energy Technology. New Publications | Hydraulically amplified self-healing electrostatic (HASEL) actuators published in Science and Science Robotics! Congratulations to the Keplinger Research Group on two publications that introduce a new class of soft artificial muscle actuators, termed HASEL. One paper, published in Science, introduces the fundamental principles of HASEL actuators, while the other, published in Science Robotics, presents Peano-HASEL actuators which rely on a different materials system to enable artificial muscles that contract on activation. Press release from the University of Colorado Boulder. Dr. Keplinger has been named a 2017 Packard Fellow! One of the most prestigious awards given to early-career scientists, this $875,000.00 unrestricted award provides funding over 5 years "to think big and look at complex issues with a fresh perspective". Press release from the University of Colorado Boulder. The Keplinger Research Group, along with the Rentschler, Correll, and Humbert groups received a NSF CPS grant to study "Synthetic, Distributed Sensing, Soft and Modular Tissue (sTISSUE)". This interdisciplinary team will receive $1,250,000.00 over the next four years. Details of the grant can be found on the NSF website. Press release from the University of Colorado Boulder. Congratulations to undergraduate students Madison Emmett, Alex Jaros, Madeline King, Trent Martin, Miles Radakovitz, and Garrett Smith for earning grants to work in the Keplinger Research Group for the entire academic year. A special thanks to CU’s Undergraduate Research Opportunities Program (UROP) for providing the funding and all the PhD students in the Keplinger Research Group for providing mentorship to these undergraduate students. Congratulations to PhD students Eric Acome, Shane Mitchell, and Nick Kellaris on completing their preliminary exams. A great step towards their PhD. Congratulations to undergraduate students Madison Emmett, Alex Jaros, Trent Martin, Miles Radakovitz, and Garrett Smith for earning grants to work in the Keplinger Research Group this summer. CU’s Undergraduate Research Opportunities Program (UROP) will provide summer funding for these students to participate in projects ranging from artifical muscles to renewable energy generation. A special thanks to all the Keplinger Research Group's PhD students for providing mentorship to these undergraduate students. Dr. Keplinger presented an invited seminar at the Department of Mechanical Engineering, National University of Singapore. Dr. Keplinger gave two invited talks at the 9th International Conference on Materials for Advanced Technologies (ICMAT 2017) in Singapore; one talk in the Transparent Electrode Materials and Devices symposium and a second talk in the Wearable and Stretchable Electronics symposium. Congratulations to M.S. 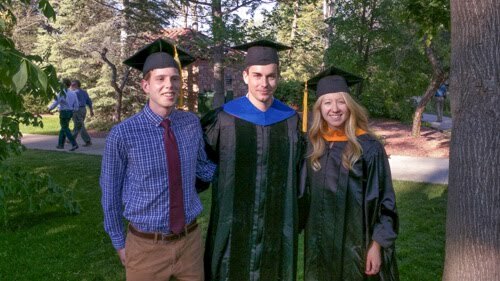 students Claire Benjamin and Eric Ambos for graduating! Claire and Eric both have been researchers in the Keplinger Research Group since Fall 2015. We wish them both the best in their future careers. Congratulations to Dr. Keplinger for publishing a new article, High-performance electromechanical transduction using laterally-constrained dielectric elastomers part I: Actuation processes, in the Journal of the Mechanics and Physics of Solids. Dr. Keplinger was a symposium organizer for the 2017 MRS Spring meeting. The symposium (SM4), titled A Soft Future - From Electronic Skin to Robotics and Energy Harvesting, featured invented talks from well-known researchers in academia and industry. Congratulations to PhD student Eric Acome for being featured on the University of Colorado Mechanical Engineering - Spotlight on Student Research. Eric’s research focuses on soft actuators and he is currently working on a new type of reliable, high-performance soft electrostatic actuator. Eric’s full award can be viewed on the department's website. Dr. Keplinger presented an invited talk at the SPIE Smart Structures/NDE, Electroactive Polymer Actuators and Devices (EAPAD) XIX in Portland, Oregon. PhD student Tim Morrissey was invited to present at the Advanced Design and Manufacturing Expo in Cleveland Ohio. He presented an educational talk on soft robotics and the Keplinger Research Group's recent work on self-healing artifical muscles. Additional details can be found on the event's website. Congratulations to PhD student Nicholas Kellaris for receiving an Honorable Mention on the National Science Foundation Graduate Research Fellowship Program. Congratulations PhD students Tim Morrissey, Eric Acome and Dr. Keplinger on a new publication. A collaboration with the University of California Riverside produced a Wolverine-inspired material that can be used to a make a self-healing artificial muscle. The article, A Transparent, Self‐Healing, Highly Stretchable Ionic Conductor, is published in the journal, Advanced Materials and was widely featured in the news! Dr. Keplinger was the Symposium organizer at the The 53rd Annual Technical Meeting of the Society of Engineering Science (SES) in College Park, Maryland. His symposium (C-11) discussed the mechanics of bioinspired soft machines. Dr. Keplinger gave an invited talk at the 2nd UMD Workshop on Distributed Sensing, Actuation, and Control for Bio­inspired Soft Robotics in College Park, Maryland. Congratulations to undergraduate student Madison Emmett for being named the University of Colorado, Mechanical Engineering - Undergraduate Student of the Month, September 2016. Madison had a productive summer of research in the Keplinger Research Group and is off to a great start in her sophomore year. Madison's full award can be seen on the department’s website. Two high school students, Max and Sunil, spent a few weeks of their summer vacation learning about engineering and artificial muscles in the Keplinger Research Group. At the end of their CU Science Discovery Program they presented their work during a capstone session. Good luck in your future endeavors Max and Sunil! Congratulations to M.S. student Claire Benjamin for being awarded the DAAD Research Internships in Science and Engineering (RISE) Pro Scholar 2016. Claire spent her summer in Germany investigating the mechanical properties of Dielectric Elastomer Actuators for commercial applications. Congratulations to undergraduate student Madison Emmett for earning a summer grant to work in the Keplinger Research Group. CU’s Undergraduate Research Opportunities Program (UROP) will provide summer funding for Madison to work on fabrication methods for more robust Dielectric Elastomer Actuators. A special thanks to PhD student Eric Acome for providing mentoring for Madison. Congratulations to P.I. Dr. Christoph Keplinger for publishing a new article, Buckling Pneumatic Linear Actuator Inspired by Muscle, in Advanced Materials Technologies. This paper introduces vacuum-actuated muscle-inspired pneumatic structures (VAMPs). VAMPs use buckling of elastomeric beams to generate muscle-like motions when negative pressure (vacuum) is applied to them. Congratulations to P.I. Dr. Christoph Keplinger for publishing a new article, A highly stretchable autonomous self-healing elastomer, in Nature Chemistry. Dr. Keplinger collaborated with a diverse group of researchers to make use of a new self-healing elastomer in a Dielectric Elastomer Actuator. Congratulations to PhD student Tim Morrissey for being featured on the University of Colorado Mechanical Engineering spotlight on student research. Tim’s research aims to develop a simple method to produce large-scale renewable energy from soft variable capacitors. Tim’s full award can be viewed on the department's website. PhD student Eric Acome made the most of his spring break by mentoring undergraduate mechanical engineering student Madeline King. These two worked together to make more robust Dielectric Elastomer Actuators. They both were awarded this opportunity thanks to sponsorship from CU BOLD Center’s Spring Break for Research Program. Dr. Keplinger presented an invited talk at the MRS spring meeting in Phoenix, Arizona. Congratulations to PhD student Tim Morrissey for earning an award at this year’s Mechanical Engineering - Graduate Engineering Annual Research & Recruitment Symposium (GEARRS). Tim gave a presentation about using soft machines to capture renewable energy, such as ocean waves. This presentation earned the Best Talk in the Mechanics/Micro-Nano Systems Session. Dr. Keplinger presented an invited talk at the 2015 MICACT Training School on Dielectric Elastomer Transducers, at EPFL, Switzerland.